The credit for today's Samoan confection goes entirely to a wonderful blog I discovered while looking for recipes to represent the island country of Samoa. As so often happens, the foodie Goddess must have been hovering over my keyboard when I clicked on Panipopos' Kitchen, a blog devoted to Samoan cooking, recipes and culture. After spending an hour scrolling through a whole range incredible recipes and videos, I settled on Masi Samoa, Coconut Cookies -- partly because I love coconut, but also because they were described as simple street fare that would make my kitchen smell like Willy Wonka's cookie factory while baking - so how could I resist!? Located in the South Pacific Ocean, the Independent State of Samoa is made up of two main islands, Upolu and Savai'i, plus nine smaller ones. Long before European whalers and explorers discovered the islands, Samoa, Tonga and Fiji were considered Pacific Ocean superpowers. But starting in the 1700's, an influx of explorers and traders, as well as missionaries flooded the island, exploiting Samoa's cocoa reserves as well as imposing their religious beliefs on a people who worshiped Gods of the sun, earth, heaven and the sea. Despite the indigenous peoples' best efforts to fight to keep control of their land, the islands spent centuries being ruled by Germans until New Zealand took control in 1918. Not until 1962 did Samoa finally gain independence when a Friendship Treaty was signed with New Zealand, making Samoa the first country in the Pacific to become independent. 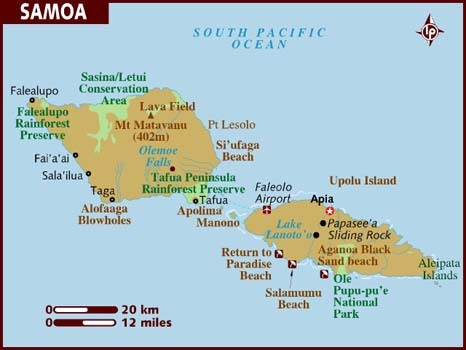 Owing to it's temperate tropical climate, Samoa has large plantations of bananas, taro, coconut and tropical fruits. Fresh seafood such as crayfish, snapper, mahi-mahi, octopus and tuna are abundant. Food is not generally spicy, but great attention to detail and enjoying meals together is part of the Samoan culture. For the best possible overview of Samoan cooking traditions as well as outstanding recipes, I highly recommend visiting Panipopos's Kitchen to further explore this beautiful country's bounty. Beat butter and sugar together until fluffy. Add coconut milk and vanilla and beat until well blended. Add flour and baking powder until it forms a dough. Transfer to the cookie sheet and bake 20-25 minutes until golden brown. Final Assessment: I love these cookies! They're easy to make, as rich as shortbread, and have a heavenly, delicate coconut flavor and scent. My kids had them for breakfast right out of the oven. I think I should have let them brown a little more, so next time I make these (and there will be a next time), I'll leave them in the oven a tad longer. And, yes, my house definitely smelled like Willy Wonka's Cookie Factory! After a long time i m visiting your website ..How this dish will taste like ? i wonder .Still i love your website ,the pics which you take,the way you explain how to do .This shows your very much passionate about cooking !! Thanks, Sheril! Hope you're well. The cookies are not too sweet and go very well with coffee or tea. Some people spread a little jam on them to sweeten them up, but I like them as is. Thanks for stopping by :) I guess you probably liked the butter picture the best, right????! Questi biscottoni sono davvero interessanti! Li voglio provare ;-) Grazie per il tuo graditissimo commento, cara! Passa a trovarmi quando vuoi, per me è un onore :-) Baci!!! Thanks, Traci! I think you could jazz them up a little with a glaze of some kind if you wanted them to look a little more festive - but I agree, I love the non-gooey, almost biscuit-like texture of these cookies. Thanks for stopping by! Good luck, her blog and videos are wonderful! I am so happy I seen your comment on the website and followed you here after googling masi Samoa recipe. The recipe is no longer on her blog :-/ as well as others for some reason but you are a life save! Thank you! I'm half Samoan and was talking to my mom about making these as well as the pai fala, a pineapple pie with a coconut crust. Sooo yummy! Anywho thank you a bunches! Happy cooking! Thank you, Vonnie!! So glad you enjoyed them. I love her blog, but don't know what happened to the recipes! Your pie sounds amazing!